Araby was published in James Joyce's short story collection, Dubliners in 1914. It is widely considered to be his finest short story, featured in our collection, Short Stories for High School. The former tenant of our house, a priest, had died in the back drawing-room. Air, musty from having been long enclosed, hung in all the rooms, and the waste room behind the kitchen was littered with old useless papers. Among these I found a few paper-covered books, the pages of which were curled and damp: The Abbot , by Walter Scott, The Devout Communicant , and The Memoirs of Vidocq . I liked the last best because its leaves were yellow. The wild garden behind the house contained a central apple-tree and a few straggling bushes, under one of which I found the late tenant's rusty bicycle-pump. He had been a very charitable priest; in his will he had left all his money to institutions and the furniture of his house to his sister. Her image accompanied me even in places the most hostile to romance. On Saturday evenings when my aunt went marketing I had to go to carry some of the parcels. We walked through the flaring streets, jostled by drunken men and bargaining women, amid the curses of labourers, the shrill litanies of shop-boys who stood on guard by the barrels of pigs' cheeks, the nasal chanting of street-singers, who sang a come-all-you about O'Donovan Rossa, or a ballad about the troubles in our native land. These noises converged in a single sensation of life for me: I imagined that I bore my chalice safely through a throng of foes. Her name sprang to my lips at moments in strange prayers and praises which I myself did not understand. My eyes were often full of tears (I could not tell why) and at times a flood from my heart seemed to pour itself out into my bosom. I thought little of the future. I did not know whether I would ever speak to her or not or, if I spoke to her, how I could tell her of my confused adoration. But my body was like a harp and her words and gestures were like fingers running upon the wires. As he was in the hall I could not go into the front parlour and lie at the window. I left the house in bad humour and walked slowly towards the school. The air was pitilessly raw and already my heart misgave me. 'The people are in bed and after their first sleep now,' he said. My uncle said he was very sorry he had forgotten. He said he believed in the old saying: 'All work and no play makes Jack a dull boy.' 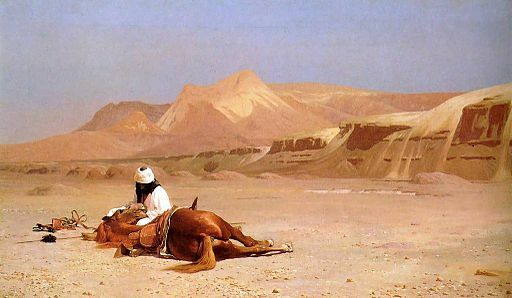 He asked me where I was going and, when I told him a second time, he asked me did I know The Arab's Farewell to His Steed . When I left the kitchen he was about to recite the opening lines of the piece to my aunt. I could not find any sixpenny entrance and, fearing that the bazaar would be closed, I passed in quickly through a turnstile, handing a shilling to a weary-looking man. I found myself in a big hall girded at half its height by a gallery. Nearly all the stalls were closed and the greater part of the hall was in darkness. I recognized a silence like that which pervades a church after a service. I walked into the centre of the bazaar timidly. A few people were gathered about the stalls which were still open. Before a curtain, over which the words Caf Chantant were written in coloured lamps, two men were counting money on a salver. I listened to the fall of the coins. Araby is one of the stories featured in our collection of Short Stories for High School I. For comparison and analysis, Araby pairs well with Witches' Loaves by O. Henry. Add Araby to your own personal library.